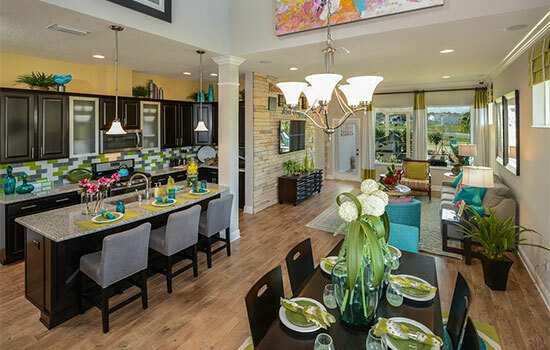 Tampa, FL (July 22, 2016): David Weekley Homes, the nation’s largest privately-held builder, is building a new model home in the Tampa community of FishHawk Ranch. The two-story Redwing will showcase the builder’s Cottage Series homes, which start from the $290s. With nearly 2,400 square feet and situated on a 40-foot homesite, the Redwing will feature four bedrooms, three full baths, one half bath, retreat, lanai and a two-car garage. Designer options for the model include wood flooring on the first floor, granite countertops in the kitchen and owner’s bath, and an extended outdoor lanai with pavers and a fire pit. David Weekley Homes has new homesites available for both its Cottage Series and Manor Series, situated on 40- and 70-foot homesites, respectively. The Redwing is one of five two-story floor plans available from the builder’s Cottage Series, with offerings ranging in size from 2,300 to 3,300 square feet. The Manor Series includes three one-story floor plans, ranging in size from 2,900 to 3,200 square feet. For more information about David Weekley Homes in FishHawk Ranch, contact 866-493-3553. David Weekley Homes has begun construction on a new model home, The Redwing, From its Cottages Series in FishHawk Ranch.